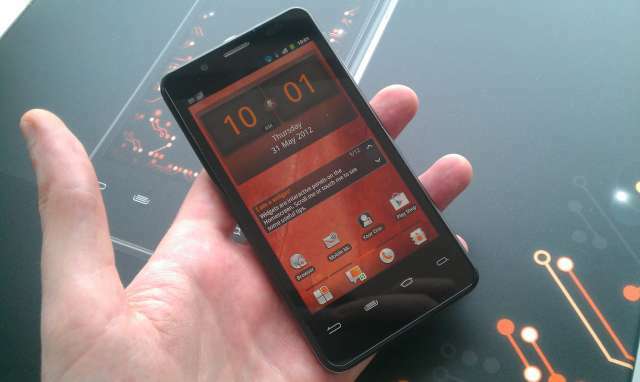 Today Orange has revealed its own-branded San Diego Android smartphone. Previously codenamed the Santa Clara, the Orange San Diego uses an Intel Atom system on a chip (pairing a Z2460 processor with an XMM 6260 modem), with the long awaited collaboration set to land with a very reasonable price tag. At £199.99 on PAYG, or £15.50 a month deal on a two year contract that runs until 25th July (£20.50 a month thereafter), it’s looking a very tempting prospect. Measuring 123mm x 63mm x 9.99m with a 4.03 inch display, it’s a tidy looking device, feeling similar in the hand to an iPhone 4S size-wise with its relative lack of curves. A 3.5mm headphone jack sits on the top side, while HDMI-output at full 1080p resolution is supported. The touchscreen, while not the most responsive we’ve ever tapped our way through gets the job done, with the Intel processor performing well. Sliding widgets around the five homescreens was smooth, with no notable lag when playing back video or quickly jumping between apps. Apps may however prove to be a sticky point for Intel-powered phones like the San Diego. Based on x86 architecture, the Sand Diego should support “most” Android apps, with Intel working hard to make sure apps are compatible with their hardware. However, conflicts between obscure Play Store apps and the new hardware are bound to arise, which may cause problems for some. The Intel chip does have other advantages though, most notably battery life. Drawing far less power from the battery, the Intel chip should allow for two weeks of standby time from the phone. We’d need a bit longer with the handset to verify that claim, but it’s promising nonetheless. Likewise, the camera offering onboard seemed pretty solid. An 8MP offering (with 1080p video capture support) it features a burst mode, and the ability to shoot 10 photos a second. If there’s one spec that belies the phone’s budget status, it’s the Android build onboard. The ageing 2.3.7 Gingerbread is the OS of choice, and while by no means a shoddy operating system, it’s lacking the bells and whistles of the latest Ice Cream Sandwich Android build. Not that that should bother the mid-range market customers Orange have the handset aimed at. All in, it’s looking quite a good deal. A more than decent mid-range device, our first look at the handset seems to promise good things from Intel-powered smartphone offerings, with Orange well placed to reap the rewards of getting onboard early. Visit Tech Digest for more about the Orange San Diego and a gallery of hands-on shots. A 3.5mm headphone jack sits on the top side, while HDMI-output at full 1080p resolution is supported.